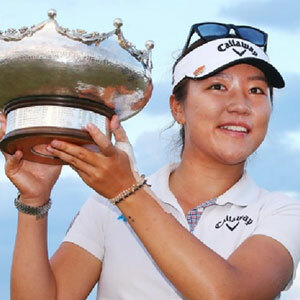 Teenage sensation Lydia Ko landed her sixth career win at the Australian Open to strengthen her position at the top of the world rankings. The 17-year-old Kiwi only turned pro last year but is starting to dominate the women’s game. It wasn’t all plain sailing for Ko at Melbourne. She was put under pressure until the final hole by South Korean Amy Yang but held her nerve to take the title. "It's great. I struggled in the last round at the last couple Australian Opens but this year, I played pretty solid. "I think that's a really important thing and just to win on such an amazing golf course here ... I think that's another bonus," Ko said. "You could see that the scores were getting up and down, somebody was leading, there was a tie, so it was very interesting, interesting for the spectators. "When you're a player, you wish you had a five-shot lead. "It was tough but I tried to make myself have a lot of opportunities and it's great to finally win the Australian Open." "Whenever I saw the leaderboard, she (Yang) had made another birdie and another one so I was like, 'OK, you need to get your stuff together and you need to make birdies'. "She's such a consistent player and she's been putting so well on these fast greens so I knew she was tough to get rid of," Ko said. Ko finished with a two-under round 71 to finish the tournament nine-under, two clear of her nearest challenger Yang. This title win is her sixth on the LPGA Tour and her fourth since turning pro only a year ago. After a tentative start, Ko regained her composure to remain in the driving seat for the majority of the final day. "The first two holes I three-putted and you really don't want to start on that kind of a note especially on the final day when you know you need to play really well," Ko said. "That third hole really kicked off well. "I couldn't really see the ball drop in the hole but people were clapping and it was getting louder as the ball was getting closer. It was great and it really helped my round." England’s Charley Hull just missed out, finishing tied seventh after finishing one under for the tournament continuing her good early season form.